I’ll admit that my husband and I have been making fun of Rick Steves for years – in a good way of course. Sorry Rick. That said, we obviously love him as we have been watching his show on PBS pretty religiously for nearly twenty years. We love you Rick Steves! and this book is no let down. What a joyful read with deep insight and critical comparative thinking about countries he has traveled. He compares them to the United States and sheds a light of unbiased realism and intellectualism that can’t be ignored. In the first chapter of Travel as a Political Act: How to Leave Your Baggage Behind Rick Steves boldly begins “Many of today’s elected leaders have no better connection with real people–especially ones outside their borders–than those “divinely ordained” kings did centuries ago.” Rick Steves recommends traveling on purpose…..to learn and connect with people across our own borders. In his words…”travel broadens our perspectives personally, culturally, and politically”. He delves into Brexit, refugees, Trump, Nativism, Terrorism, and climate change. This is a well-written perspective from a master teacher traveler. 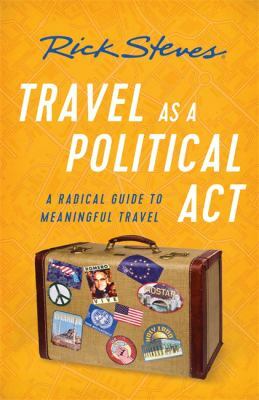 I highly recommend Travel as a Political Act: How to Leave Your Baggage Behind to crack open your mind just a little bit more, or to crack open your heart and let some love of your fellow human beings enter. Don’t be afraid to travel or fear the unknown. The world is yours for the taking….be fearless and travel widely.